The walleye is a slender, spiny-rayed fish with two separate dorsal fins. The mouth is large, the upper jaw extending about to the hind edge of the eye. The jaws and roof of mouth have prominent teeth. The hind edge of the bone just in front of the gill cover is saw-toothed. The tail is forked. The back and sides are yellowish or olive-brown with darker mottlings and blotches. The belly is white. There are two separate dorsal fins. The spinous dorsal fin is streaked and blotched with black, usually with a large black blotch near the bases of the last few spines. The eyes of this nocturnal fish are very reflective. Adult length: 12–28 inches; weight: 8 ounces to 8 pounds. Much larger specimens can occur. Video of walleye in the wild. Inhabits open water of lakes and reservoirs and the pools of streams. In the Current River, most are found in pools 12 feet or deeper where the bottom is broken up by boulders or submerged logs. By day they stay in these depths. At night they move to shallower water. Fry eat small crustaceans and insects. Insects, particularly mayflies, are a significant food item throughout life, but fish are the principal food of adults. Walleyes are nocturnal and retreat to deep water during the day. The opaque “walleyed” appearance of this species is a result of their eyes’ adaptation for seeing in low light. Found in large streams throughout Missouri and occurs naturally or via stocking in many reservoirs. Numbers of walleye are increasing in this state due to increased stocking over the past decade. Walleye are one of the first fish to spawn in spring. Spawning typically begins when water temperatures exceed 46F. Mature walleye spawn on gravel shoals of tributary streams that flow into large reservoirs and on rocky points or along the rocky face of dams within the reservoir. Eggs are deposited along the rocks and left to develop without any parental care. Excellent sporting qualities, large size, and firm, tender flesh make the walleye one of the most important freshwater game fishes on the continent. 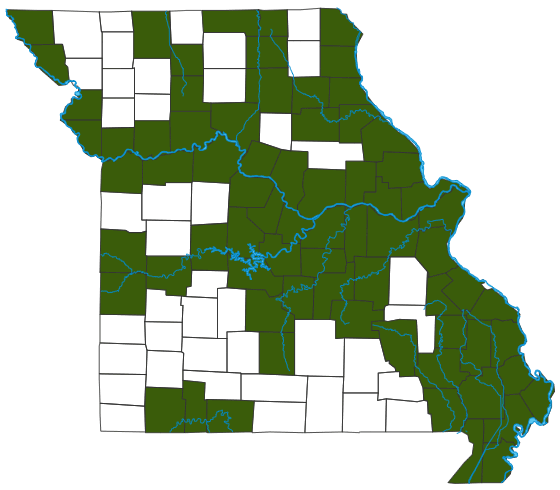 In other states it is fished commercially, but in Missouri it is strictly a game fish. Like all fish, walleye begin life as tiny fry that are vulnerable and serve as food to many kinds of fish, but the walleye that survive and grow large often become the top predators of their waters, feeding almost exclusively on smaller fish.